Alternately dubbed the City of Love and Le Petit Paris, Dalat has a distinctly French influence, from the strong cafe culture to the approximation of the Eiffel Tower perched over the main square. It is a town perfect for strolling, small and condensed with enough streets and scenery to keep your eyes occupied. 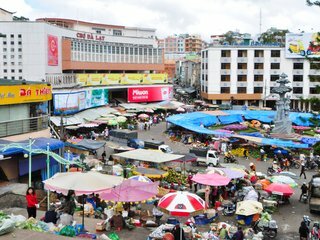 Local life in Dalat revolves around the central market, a hub of activity from the early morning rush all the way through dinner. Famous for its fresh produce, be sure to investigate some of Dalat’s signature crops. Lush conditions echo throughout the area, resulting in a dizzying collection of manicured gardens, wild woods, sweeping plantations and hidden mountain retreats. Many attractions such as Datlana Waterfall are nestled into pine forests, within a day hike’s reach. For the religiously minded, there is a selection of stunning pagodas to choose from and a few leftover French churches. Not ones to skimp on decoration, the French touch is evident, present also in the two towering palaces, Bao Dai Summer Palace and Dalat Palace. 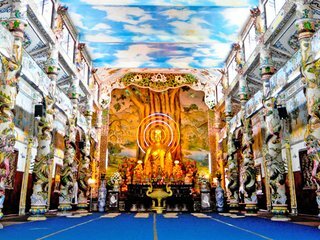 Classical reminders of the city’s initial status as a getaway for Vietnam’s upper crust, pay a visit to the glory of the past.